Witches of the World, unite! If youre a real Witch, but dont always take yourself too seriously... if you sometimes enjoy having fun with the image, whether in a mildly whimsical or wildly madcap but ultimately empowering way, this ultra-Witchy social club is for you! Just imagine what spectacular subversion we may be brewing here: rune-chanting, spell-casting hordes of wonderful Witches streaming stalwartly some day down Mystic Main Street, USA, or points beyond  our trusty gnarled old besoms in hand, our Goddess-given gleaming pentacle pendants all but pirouetting proudly on our fervent bosoms (scandalously skyclad or non-), our tall pointy black hats and cacklesque cosmic cones of power aimed strategically at both Inner and Outer Stratospheres! Not even the skys the limit! Little Witch Grrls and Sorcerers Apprentices of all ages, welcome  even if your Witch-hat of choice is actually green, blue, silver, pink, red with white stripes, or whatever. Party on, noble Pentagram People! 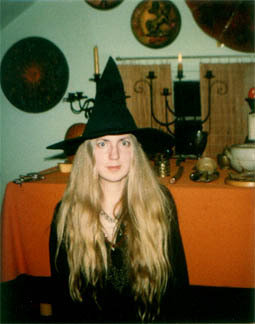 Watch this page for forthcoming info about activities and way too much Witchy fun! Peter Pan. She most likely sang Samhain Fires or Tis Halloween instead.